Last year, Alexandra Stafford published a very good book about bread. It sprang from a recipe for the peasant bread her mother made often when she was growing up. When she shared it on her site, it went viral, which is no surprise given that it’s no-knead, comes together in under five minutes, rises in about an hour, and after a brief second rise, you bake it in buttered bowls that form it into a blond, buttery crusted bread that she boasts is “the antithesis of artisan.” Because there are no hidden tricks; no steam ovens, special flours, lames to score the crust, or bannetons to shape the loaves. Her central tenet is that “good bread can be made without a starter, without a slow or cold fermentation, without an understanding of bakers’ percentages, without being fluent in the baking vernacular: hydration, fermentation, biga, poolish, soaker, autolyse, barm.” (None of those words appear in the book.) She knows that there are a lot of no-knead breads out there, but this is the only one that can be started at 4pm and be on the dinner table at 7. I realize you’re thinking, as I briefly worried before I read it, how does one write an entire cookbook based on one recipe? But Stafford is a gifted recipe developer, and there isn’t a thing in this book — one part breads (with all types of flours, grains, and shapes, including pizzas, flatbreads, rolls and buns), one part toasts (including sandwiches, tartines, stratas, panzanellas, soups, summer puddings and so much more), and one part crumbs (a celebration of crunchy gratin toppings, stuffing, burgers, eggplant parmesan, fish sticks, meatballs, and brown bettys) — that I didn’t want to make. (I suspect that having four kids to feed ensures that these recipes were vetted by the most finicky of reviewer classes.) It’s also a gorgeous book, with a focus and format that my inner, long-surrendered organized person finds deeply pleasing. My favorite thing in the book, and the one that I come back to again and again, is using the core bread recipe to make a focaccia that can be split and filled to make a sheet pan’s worth of sandwiches. * File this under things I never thought about pre-kids but obsess over now: Picking up sandwiches to go to the beach/park/pool/wherever your summer weekend takes you for a family or group of friends can be staggeringly expensive. I might even forgive the price if the sandwiches were usually better, but I’m sorry-not-sorry, they’re usually not. Either the bread is lousy and processed to the hilt, or they just don’t make them the way I want them, which is heavy on the vegetables and with a good mix of fresh, salty, crunchy, and pickle-like ingredients. Let’s fix this. Below is the recipe for the simplest, quickest focaccia you’ll ever need to make and several sandwich filling suggestions (many vegan, too) I hope you’ll find good jumping off points. * If you have Smitten Kitchen Every Day at home (do you? I bet you’d love it, I’m just saying) you probably already know about my slab-sized sandwich fixation. In the book, I use roasted tomatoes and more to stuff a focaccia *before* it is baked, inspired by a foccia ripiena we ate in Rome several years ago. This is concept is similar, but there’s no need to pre-commit to fillings. Servings will vary by how you cut the focaccia, of course. Here I show 12 small/medium sandwiches. Depending on how hearty your fillings are, each person may eat 1 to 2 sandwiches. You can choose your own schedule with this bread, by proving it for 1 to 1 1/2 hours at room temperature, overnight in fridge, or 10 hours at room temperature. For the last option, you want to make the bread with cold tap water. To use active dry yeast instead of instant yeast, add it directly to the lukewarm water with a pinch of sugar to proof it for 10 minutes (it will get foamy) and then add it below where you will the water. For more of a traditional focaccia flavor, you can sprinkle 1 tablespoon chopped or minced fresh rosemary over the top with the salt before baking it. Quickest rise: Set aside in a warmish spot for 1 to 1 1/2 hours, until doubled. Overnight in fridge: Set inside your refrigerator overnight, about 8 to 10 hours. Overnight at room temperature: For this method, you will need to use only cold, no lukewarm, water. Leave the bowl on your counter at room temperature for 10 hours. 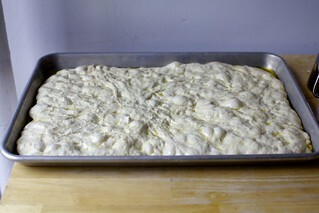 When you’re ready to make your focaccia: Pour 3 tablespoons oil onto a rimmed sheet pan (can use a 13×18, or half-sheet pan, but if you have something more 11×17-ish, as I use here, will make for slightly thicker loaf; you can line it first with parchment paper for maximum nonstick security). 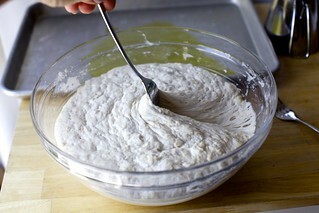 Using two forks, deflate the dough by releasing it from the sides of the bowl and pulling it toward the center. Rotate the bowl in quarter turns as you deflate, turning the mass into a rough ball. Use the forks to lift the dough onto the prepared sheet pan. Roll the dough ball in the oil to coat it all over. Let dough rest for 20 minutes (for Quickest rise or Overnight at room temperature) or 1 hour (if you used the Overnight in the fridge rise, so it warms up) without touching it. Then, drizzle last 1 tablespoon of olive oil over and use your fingertips to stretch and press the dough to the edges, leaving it intentionally dimply. If your dough resists being stretched all the way, get it as stretched as you can, wait 5 minutes, and return to stretch it the rest of the way, repeating this rest if needed. Sprinkle with flaky sea salt all over and bake for 20 to 25 minutes, checking in on the earlier end, until lightly puffed on top and golden and crisp underneath. Remove from oven and let cool completely (this will go faster if you transfer the bread to a cooling rack) before assembling sandwiches. To make sandwiches: If you’d like, you can trim off the very outer edges — this exposes the crumb and makes it a little easier to halve. (I didn’t do this because I like to make things hard, also I like edges.) Stafford recommends you begin the halving process by cutting through each corner, then running the serrated knife through the short end until you get to the midway point, then starting from the other short end until I get to the midway point. A sharp, serrated knife is helpful. Try to keep your knife as parallel to the bread as possible. She says she finds if she hugs the top layer as opposed to aiming for the center, she gets a more even cut. Avocado + Crispy Kale [Shown]: First, crisp your kale. I used a 5-ounce clamshell of curly kale leaves, tearing out and discarding any thick ribs. Rub/toss them with 1 tablespoon olive oil, spread them on a large baking sheet in one layer, seasoned them with salt and pepper, and baked them at 375&#176F for 10 to 15 minutes, until crispy and just barely brown at the edges (keep an eye on it). 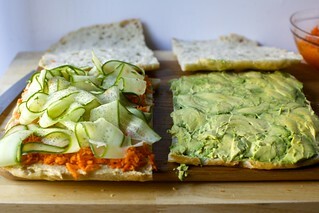 Then, scoop out and slice 4 avocados, fan the slices across the bread and mash/spread them smooth. Coat with olive oil, lemon juice, flaky salt, and red pepper flakes (like we do here). Spread crispy kale over avocado. Hummus + Cucumber + Pickled Carrots [Shown]: First, coarsely grate 1 pound of carrots. Pour 1/2 cup apple cider vinegar, 1/2 cup cold water, 1 teaspoon kosher salt, and 1 to 2 teaspoons (to taste) of granulated sugar over it and stir to combine. (You could also add mustard or dill seeds or fresh chile peppers here.) Chill in the fridge for as long as you have — 30 minutes, an hour, and up to a few days. Carrots will get more pickled the longer it soaks. To make your sandwiches, schmear the bottom half of the bread with about 1 1/2 cups hummus (storebought or homemade). Squeeze out little handfuls of pickled carrot and sprinkle this on as your next layer. For you final layer, use a y-peeler to shave long ribbons off 1 large (1/2 to 3/4 pound) seedless cucumber. Tousel these on top; season them with salt and pepper. Many of the salads from the archives, such as this egg salad, this chicken salad (not vegetarian, of course), that chicken salad, or even (I love this as a sandwich) this chicken caesar, with the dressing spread on both sides of the bread, the chicken thinly sliced, and the romaine cut into thin ribbons. I wouldn’t be sad to have a broccoli or cauliflower slaw between bread, either. I’m SO EXCITED by this b/c I just love BTC, and Alexandra as well. I highly recommend using 1/2 AP flour and 1/2 bread flour. She has a foccacia on her website that uses 00 flour, and I loved that too. (note: In the head note, I think that you meant “proofing it” rather than “proving it”! Proof and prove – same thing. Will this bread freeze well?? I always do it baked as you can cut it into more manageable slices or 1/4. A whole full sheet pan is a lot of bread. Great for a party but a little much for my breakfast! Focaccia is definitely best fresh day of but I make it a lot (the recipe from Saltie’s cookbook but I will be trying this one ; )) ) and frozen wrapped tightly in foil it is wonderful if you reheat nicely in the oven or toasted it is perfect. I love a herbed focaccia with jam on it…so delicious. I have an oven that doesn’t go above 350F, and it always makes me hesitate to try bread recipes. Any ideas on what would happen if I bake this at 350? Should I just bake it longer? It will bake just fine, maybe just less color in the end. I bake an extremely similar recipe at 350 as Sicilian pizza and it works fine. I even do the same stretching method with olive oil, funny enough. It should brown for you too. Also! Sandwich breads usually bake at 350, if you are feeling brave. Intrigued by your tea towel covering the bowl. Seems to be made for that purpose – can you provide a source? Actually, Alexandra Stafford sent it, just part of book publicity and I got a kick out of it. Any towel or plastic wrap will work. 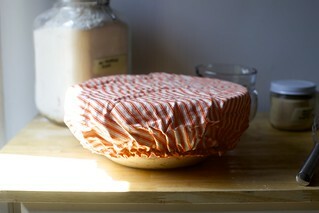 My non-pro go-to tip for these are elastic bowl covers from the grocery store. Yes they are plastic but I’ve re-used mine for years and they are awesome for bread. I use them over the bowl *and* over the rising loaves as they will slip over a loaf pan or banneton, keep the dough nice and moist, and still allow room for expansion. I even found a large sized one that fits over an entire small sheet pan for things like focaccia and rolls. Not as cute are yours but super handy! I use hotel shower caps I’ve taken to cover bowls while proofing. They last for ages, and I travel enough to easily replace them as needed. Deanna ~I travel often and have lots of these shower caps as well. I always wondered about the food safety of them?? Thanks! I now want one, lol. My friend made me beeswax food wraps, and I find they are perfect for this. They are expensive commercially, but if you’re so inclined, are very easily made. Just google. The bowl covers are edged with elastic. Alexandra provides the source on her website (AlexandraCooks.com), along with the bread recipe, which is fantastic! I went to that website and don’t see a source for the bowl covers. 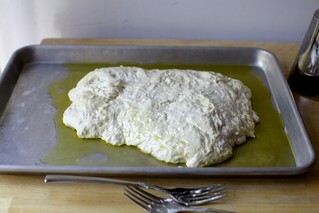 I love making focaccia and will try this one soon. But the idea to cut it into squares for sandwiches is genius. THAT is a keeper! Yes! I figured this out a while back, but my go-to focaccia recipe… is not a quick one. I end up reaching for Acme’s herb slab (which is not a bad option), but I am excited to have a quick bread that is actually a bread and not cake option. Those acme slabs also make great grilled cheese croutons! Any adjustments for baking this at altitude? I live in Denver at a mile above sea level. Sorry, I haven’t baked at high altitude. I’d peruse King Arthur’s tips for suggestions. I’m not Deb and I don’t play her on TV but I live/cook/bake at 7000 feet here in Santa Fe. I haven’t found yeasted doughs to need that much adjusting for my altitude but often they will rise faster than specified in the recipe. To counteract this, I will sometimes decrease the amount of yeast by about 1/3rd or let the dough rise once, punch it down and then go for a second rise. Sometimes cooking times are shorter too so keep an eye on things toward the end of the specified cooking time. Cakes/quick breads/and especially brownies need a bit more adjusting. I agree with Nirinjan – I used to live at 5,000ft, and for yeasted breads I would usually decrease the yeast a bit, and do an additional rise. That will give the gluten enough time to actually develop so you don’t end up with crumby (literally) bread. Yes, absolutely. I don’t know her formulas offhand but she has several variations in the book. But wow! I’m excited to see this and hope to try it soon. Nope, they’re both correct. Hope you enjoy! Do you think I could bake this on my silpat? Longtime reader, rare commentor, but I just have to say that I am SO EXCITED to make this! I am also in the “young kid” part of my life, and find myself steering toward kid-friendly recipes. Ones that include vegetables AND quick, homemade bread? Sign. Me. Up. proofing or proving—both are correct; iirc “proving” is more frequently used in the UK, “proofing” in the US. Any idea the temperature of your “lukewarm” water? I’d love to just set my electric kettle to that temperature for all of the water, as it would be less fussy. :-) Thanks! It should be about 110 degrees .I like Alexandra’s recommendation of 1/2 cup boiling water with 1 1/2 cups of room temperature water. If you’re using instant yeast, it won’t really matter though. 110 degree water is necessary for activating active dry yeast, not strictly necessary here for instant yeast, however, I, too, find that instant yeast gets moving faster when lukewarm water is used. Contemplating brunch-like, possibly egg-based fillings. She’s got a great one here. And I have a “slab” frittata in Smitten Kitchen Every Day that, as Rebecca mentioned (thank you), would also be great here. I used Alexandra’s focaccia recipe and the frittata for a crowd recipe from your most recent book for a teacher appreciation lunch this year and felt like a hero! Both in 9×11 pans, you can cut the bread, place the sheet of frittata in the middle, and cut into the most lovely, tidy squares. It feeds 24 with sides or 12 on its own. Thanks for making me look so good! **sigh** best post ever! If I wasn’t in The Mall I may lick the screen! 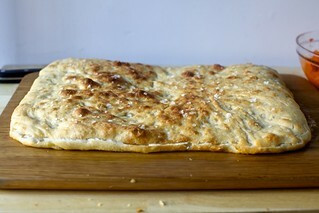 I have made Alexandra’s bread recipes (including this focaccia) many times. I use her hack for creating the “warmish spot”–preheat the oven at 350 for 1 full minute. Turn off the heat. Put the covered bowl of dough in warm oven and check after 1.5 hours. Turns out great every time. Looking forward to trying your combinations! How long does this bread keep? Can I make it the day before I want to eat it? It keeps but might be the tiniest bit more stale on the second day. I wonder how this would do on the grill? It looks delicious and a great way for my children to get involved and add their own toppings. I love grilled bread — but it cooks fast! I just previewed Alexandra’s book on Amazon and noticed that most of her recipes use 2 teaspoons of sugar. She also notes possible variations that omit the sweetener. Do you ever reduce the sugar, and if so, what are your results? I notice you only use a pinch for this recipe. The focaccia didn’t call for the sugar; I don’t think it’s required. The focaccia in the book doesn’t call for sugar, so I didn’t use it here. I don’t think it needs it. Yum, always looking for this kind of crowd stuff! I adore Ali and her book! All her recipes are winners! I made this with a rosemary, garlic and salt top last night. Delicious, oh so simply and pairs with SO MUCH. I made them into fried egg sandwiches that we dipped in marinara. Delicious. This is amazing bread..cooked in the little bowls, which I found for 10 cents each at Goodwill…or as focaccia or any other variation!!!! I actually own Bread Toast Crumbs…as well as both of your cookbooks. I’m totally enjoying cooking my way through all three…not one dud in the bunch. BTW, those trimmed edges make fabulous croutons…..if you don’t eat them as the chef’s treat first!! I love this bread idea! I have her book but have not tried this yet. I love her book! Oh…I have your book, too! And I love it, too! I have been contemplating Alexandra Stafford’s mother’s peasant bread recipe for awhile, and here is my concern: With such a short raising time, how can any flavor develop? I don’t like bland, no-flavor bread. Any feedback? Thanks. The love this! I just made it, subbing spelt flour for wheat and it turned out lovely. Or rather, it actually didn’t ‘turn out’ at all as I neglected the layer of baking paper in the base of my usually unproblematic and very well oiled pan. The base was basically welded to the pan so I had to decapitate it to get it out and the pan is now soaking in the sink. Ahem. But apart from that faux pas, it was easy and tasted lovely! Side bar question regarding your sandwich filling options. Saw mint leaves as one of the ingredients in the asparagus & egg salad and the salsa verde. Is that true mint or spearmint ? Baked the focaccia, but hungry family ate it before I could stop them. Good reason to bake a second time. I’m not sure at all, tbh. I didn’t realize spearmint wasn’t real mint but I don’t think that’s what I grow or use, anyway. Perfection! Don’t skimp on the salt on top. Leave it in the oven slightly longer than you are comfortable with. 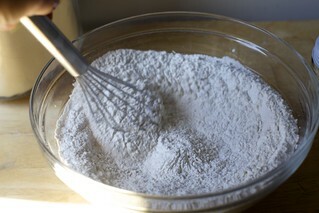 I’m attempting this with whatever flour I could find (new baby = haven’t baked in a while). I’ve used 3.5 C AP, 1 C WW, 0.5C buckwheat. AND my yeast was expired lol. Only by a month but it foamed up ok in warm water and a little sugar. FIngers crossed it turns out fine! Love your recipes and your cookbook. SK is my FAVORITE!!! Can good bread be made without a starter? All depends on your definition of good bread. As a sourdough aficionado for taste as well as health … AND as a natural “yeast” aka starter person … go fer it but I like the process, the taste and the benefits of a more natural method. I baked “traditional kneaded, commercial yeast breads for 30 years”. Then did the “Artisan in 5” and for the last 3 years natural yeast/sourdough. In my mind there is no comparison in taste. Natural yeast for me. And like @Liz, I love the process and the slowdown. Oh. Another thing with naturally yeasted breads. They do not go stale in 1-2 days. Just made the focaccia with my 15 year old son thinking we’d use it to make his school lunch for the next couple of days. Instead the family pretty much devoured the whole thing while warm and dipped in olive oil and herbs. Scrumptious! In this recipe you use 1 teaspoon instant yeast, but in the original recipe have from Alexandra’s kitchen, she uses 2 teaspoons. This seems a fairly significant difference, no? I would have thought that doing the quick rise version might require the 2 teaspoons. Not sure why she changed it between the site and book, but this is what’s in the book and more importantly, it totally works. Can you substitute sour dough starter for the yeast, as I recently started using sour dough starter for no knead, baguettes and tartin breads. If so, any idea on the adjustment to the recipe? Thanks in advance, a devoted fan. I just pulled this out of the oven – so good for a quick yeast bread. I halved the recipe and ended up baking in an 8 in cast iron and it was perfect! Crispy bottom, fluffy inside, and the right hint of salt. Should this be baked and eaten on the same day? I assume so but I wanted to double check. I’m planning to double or triple the recipe and use to it make little sandwiches for a late afternoon baby shower. Did you leave the sugar out from her recipe on purpose? Making it based on your recipe and it’s rising really slow even in an 80 degree house. The version in the book didn’t include sugar in the focaccia. I think? I’m not sure where my kids have buried the book right now. ah ha, that’s why. thanks. we made your best birthday cake yesterday for my daughter’s 7th birthday. It was a hit!!! This was a huge hit in our family – we did a make-your-own-sandwich dinner that included the focaccia and all sorts of filling options (cheeses, fresh vegetables, pickled vegetables, pesto, tapenade, hummus, etc.). My little people hadn’t even finished their meal and were asking for it again soon. Win-win as far as I’m concerned! Next time I might let the dough relax in the pan a bit longer as my corners were thinner than the middle (not that anyone noticed or complained – just thinking ahead for next time). Just out of curiosity… have you come across and tried a focaccia recipe that is gluten free? I would love to try baking these if you know of a gluten free version. 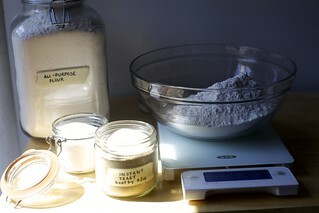 If not, I will just try tinkering with different flour blends. Thanks so much! Look at King Arthur Flour’s. I haven’t tried it but they’re pretty reliable! Hello- did you have to adjust the baking time with this size pan? Thanks!!! Glad to know it worked with 1/2 whole wheat. Thanks. Pickled carrots with hummus? That is such a great idea! I love the hummus + veggies combo but I do get sick of it sometimes after my five millionth hummus sandwich (especially since all the sandwich places around here seem to think vegans only want hummus, and nothing more exciting). Hummus and carrots are one of my favourite combinations but I never thought of pickled carrots. Definitely going to try this combo soon (whether I find the time to bake my own focaccia or buy some good bread from the bakery!). I’m amazed at how easy this bread was – and it was still tasty the next day! I did find it was too much oil – it pooled in the pan – so I poured some off but then the top didn’t brown as much as I’d hoped — should I have left it? Served it with your eggplant caviar dish and obsessively good cucumber salad for a smitten kitchen trio of deliciousness! I’ve made this bread twice and both times it was oily coming out from the oven. The second time I made it I halved the recipe and used 1 tbps of oil which helped but still more oily than I expected. The bread was still delicious, but wondering if anyone else had an issue with the oil content? I would say that focaccia is an oily bread by design. It gives it the typical color/crisp/flavor. However, you can always try to reduce it if it doesn’t suit you. This was super super delicious, everything I hoped it would be! Totally in character with every single time I try to make bread, it didn’t quite rise as much as I would have hoped and was a little tough, but was still very tasty and workable to turn into sandwiches. I didn’t have an rosemary, but had some fresh thyme lying around, so tossed that on there and it was great. For fillings, I used the crunchy kale and avocado, and did the egg salad with pickled celery. Both were delicious, but I think that I liked the crunchy kale a little bit more. This was just so satisfying, one of my favorites I think! Going to keep my battle with yeast as well, one day I will win. I made focaccia once about 10 years ago from a KAF recipe called “blitz bread.” The recipe is very similar to this one and I’m not sure why I never made it again — it was good and simple. I started making her bread before the book, which I have, was published. The ingredients and amounts are identical to that in the recipe I’ve been for 10+ years. The difference is in the technique. The one I’ve used to years calls for a few minutes of kneading (5 or less) after the first rise. The technique I use depends on the result I want. What happens if you plan for the 1-1.5 hour rise but your 3 year old and 8 month old have other plans and it turns into 2 or 3 hours? At 2 hours, it’s almost definitely forgiving. At 3, not sure. Give it a poke, if it deflates to something very flat, it might be problematic but it can’t hurt to bake it and find out. Pretty impressed you’re making bread with two littles underfoot, just the same! I’ve never made focaccia before! I’m excited to give it a try now. Love this recipe! I have your book and Bread Toast Crumbs… Make peasant bread 2-3 times a week! Add all kinds of wonderful things and it comes out perfect every time! Focaccia for a crowd is amazing! What a great idea! Might there be a missing link to a chicken caesar recipe in the second-to-last bullet point? Oops, thanks for the heads up. Here’s the correct link. Do you think this recipe might work as a sheet pan pizza? As in putting pizza sauce and cheese on top before baking. Yes — she has a bunch of recipes in her book for flatbreads and pizzas. I can’t remember what tweaks she recommends. I made as pizza and it was great! I used a half sheet pan with parchment paper. I used 50% white whole wheat and 50% bread flour. 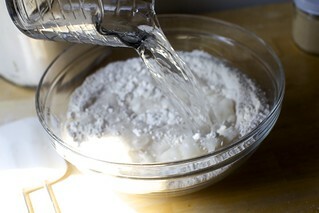 After stirring it initially, it seemed dry for no knead bread so I added more water. I’ve made a lot of no knead bread and was looking for a certain wet consistency. Topped half with veggies and all of it with homemade vegan mozzarella cheese. This was easy and tasty. Thanks so much for the recipe because I’ve been wanting to do an easy sheet pan pizza for a long time. Delicious ,but like one other comment, mine was cemented to the pan. I will try it again on parchment. I Sprinkled the top with sesame seeds. This was bread was even better than i hoped! It turned out so well i couldn’t resist baking another the very next day. This time studded with Greek olives. Another winner. Thanks deb! Welp I’m hosting a crowd in 2 weeks — so I tried the focaccia last night – and WOW WEE it’s terrific. So vegetarian sandwiches along with other foods are on my menu now! I had to give the L.O.’s away to neighbors yesterday just so I wouldn’t eat it all up! I made them happy! The only thing wrong with this recipe is that I want to make ALL the filling options. The focaccia was superb-really easy and delicious. We did the walnut pesto with crispy kale and the zucchini salad, but seriously going to make again this weekend with other fillings. So good! About how much should we expect it to rise in the first rise? I’m worried my yeast (fast rise) is doing too much work. It’s been sitting for 5 hours (of the 10 @ room temp) and already spilled over its bowl. …I did double it, and realized too late that my bowl probably wasn’t big enough. I suppose this is why they recommend testing new recipes before you try them on parties of people. If it’s more than doubled, either move it to the fridge to try to halt it until needed or just go move on with the recipe now, so it doesn’t overproof and then collapse. Did you start with cold water? I thought I started with cold water, but after seeing how much it rose, I second-guessed myself (side effect of baking with a 2.5 year old). I will remember those options next time! It did start to collapse a little, and the bread was a little dense… which was a good reason to try it again! Which I did, using the shortest rise time. That loaf was much lighter and airy. A good learning experience! It was all a hit at the party. i love the fact that you made the focaccia bread from scratch because it is not always easy to get one from the grocery store, the sandwich looks simply amazing! I couldn´t believe this would work, with no kneading at all! Gave it a try anyways, since your recipes almost always work for me, and it was awesome! Thank you for this great recipe! Will definitely make this again. Making this today to serve as a vessel for farmer’s market cherry tomatoes and burrata! The photos you post to your instagram stories of that creation are just stunning…why can’t I find them anywhere permanent on the site?! Thanks. I can put them somewhere but it’s not really a recipe so there isn’t much to say about it here. EXACTLY as written except used fennel in place of the rosemary and stuffed to the gills with leftover pulled pork, pickled red onions, and some browned butter sautéed chanterelles because I was feeling fancy. This might be the best smitten kitchen recipe to date and that is saying a lot since they are all 11/10. I made this focaccia for a picnic we took to a friend on her lunch break today and it did not disappoint. I did hummus, cucumbers, tomatoes, and feta. Ham, cheddar, pickle, spinach for the kids. They were amazing! I cannot wait to make this versatile bread again and again! Amazing and foolproof! Made the avocado/kale and hummus/cucumber/pickled carrot versions. Making it again this weekend. SK never, ever disappoints. Any thoughts on what might happen with a longer refrigerated proof? Like if I made the dough on Sunday night, for Monday night dinner? I’m not sure I can make the dough in the morning, before work, so that I can bake it before dinner. Any luck with the longer rise? thx! Deb, is there a way on your site to “bookmark” recipes so I can easily organize which ones I especially want to remember and make? This focaccia is so easy to make and so delicious. I served the sun dried tomato/walnut pesto with grilled eggplant. What a perfect combination. Grilled zucchini with hummus and a sprinkling of zataar was excellent too. One note – when I pulled the bread out of the oven I was worried about the amount of olive oil it was still sitting in. But the bread absorbs the oil while it cools and winds up with a luxurious exterior. Exactly the perfect thing for dinner at a kid’s soccer game: baked it in the afternoon, the kid who was playing took about 1/4 for an egg-and-spicy pepper sandwich (with melted cheese), and the rest of us had a packed dinner of roasted peppers, big (thin) salami slices, leftover grilled eggplants, more spicy grilled peppers, olive halves and melted provolone. We’ll be doing that again — there are more evening games, and this was a big hit! Fantastico! Came together very easily. I used a 13×18 sheet pan, and it was indeed too thin to cut in half thru the center. We just made open-faced sammies instead. Keeper! It was so easy that my 8-year-old made it (with a bit of help)! I made Alexandra’s original recipe previously, and found that the technique for transferring the dough to the pan was unnecessarily complicated. For both recipes, we scraped the dough straight onto the greased pan, then deflated it and pressed it to fit the pan. Delicious! I can confirm that it keeps overnight if well-wrapped in plastic. It was a bit softer and just right for a Labour Day sandwich party! Sadly, I think mine over-proofed– I made the “cold water, 10 hour rise” version, but it was pretty warm in my kitchen and while the dough looked to have doubled nicely it didn’t rise at all in the oven. Coupled with my 13×18″ pan, I ended up with flatbread (literally, it was about 1/4″ high in some spots) that tasted good, but was never going to allow for splitting to make sandwiches. I’ll try the shorter rise next time. 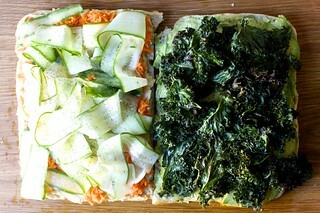 That being said, avocado and crispy kale is my new favorite summer sandwich combination! Same thing happened to me. I will not do the overnight rise again. Same here! I used the 10 hour room temp rise with active yeast- I put it in the cold water with a pinch of sugar, so maybe that was the problem? Such a bummer, but will definitely try again! Amazing recipe! This looks so good and easy! Delicious and so easy! I slapped mine on the grill quickly before serving with fresh mozzarella, basil, tomatoes, and balsamic. I’ll be making these again soon! I just made focaccia last night and have some leftover. 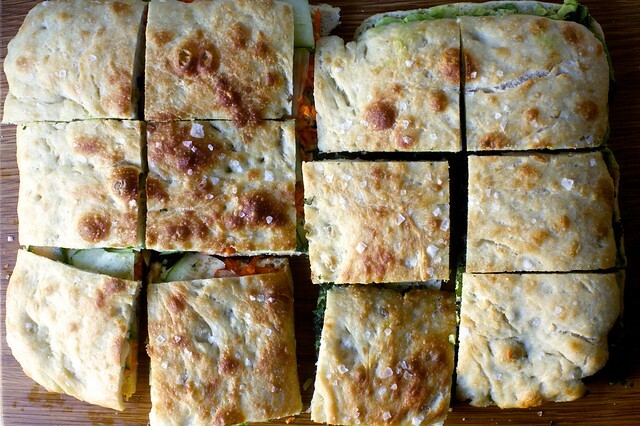 So today’s lunch will be focaccia sandwiches! 2) Do you think this would reheat well on a grill? This recipe is amazing! I’ve made it at least a dozen times since you published it, including several variations. My favourite so far was a turkish bread+focaccia mashup. I added 2 tbsp nigella+sesame seeds to the dough and scattered more sesame seeds on top. Delicious! Perfect for a middle eastern inspired mezze dinner to share with friends. So after laying in bed at 5am eyeing this recipe, I made it. It was so easy and came out phenomenal. I did the 1.5 hr rise with half all purpose and half bread flour, and it was perfect. Sprinkled with a little salt, (might add rosemary next time for my preference), and it’s simple and tasty. My daughter is currently eating a piece smothered in strawberry jam. (She eats nothing, btw.) I’ll gladly make this to replace the crappy store brand bread I’ve bought in years past! I’m making a boat load of sandwiches for my sons birthday party and am trying to plan things out so I can have as much prep done as possible. Do you think the kale would keep crisped in advance? Absolutely perfect. I’ve made this a number of times and it never fails. Great with the watermelon cucumber salad from the site. I love to make it for parties because it can sit at room temperature for a few hours for a flexible serving time. Thank you for another amazing recipe!